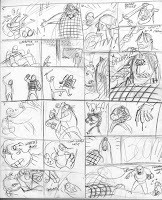 A while back I wrote and drew a short for The Goon. I absolutely loved working on it, and wish I could do more with the character. Anyway, here's the "script". You'll notice that there are more pages here then I ended up with. Check them out closely, and you'll see that I trimmed it down to bring it in at six pages. 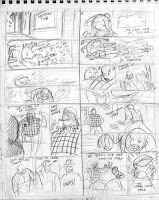 Here are the pencils, some of my favorite ever. I'll post the inks later. Nice to see the pencils for this. Oh man...cannot wait to see the inks. Anyone who can't get into The Goon just isn't human. Great character and great treatment Mike. Nice! Thanks, fellas. It was a huge ammount of fun! Loved it and hope you can do more some time in the future! Thanks guys. I really would love to draw more Goon... if I only had more time!